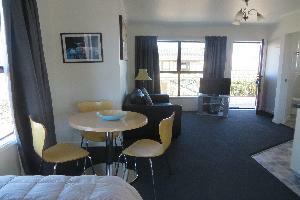 Sunny spacious ground floor fully self contained two bedroom unit with 2 king beds. 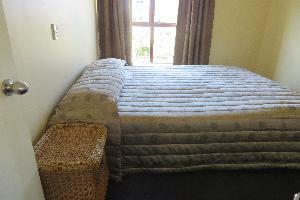 A single bed can be placed in the lounge if required. Full kitchen. Sky TV. 32 inch TV. DVD player. Complimentary DVD library. Bathroom off lounge. Couch. Guest chair. Dining room table and chairs. Outside seating. Parking directly outside unit. Unit 2. Two bedroom unit. 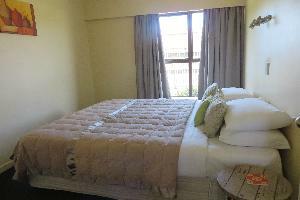 Sunny spacious ground floor fully self contained two bedroom unit with 2 king beds. 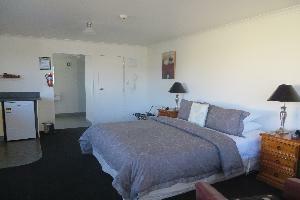 A single bed can be placed in the lounge if required. Full kitchen. Sky TV. 32 inch TV. DVD player. Complimentary DVD library. Bathroom off lounge. Couch. A guest chair. Dining room table and chairs. Outside seating. Parking directly outside unit. Sunny spacious ground floor fully self contained two bedroom unit with 2 King split beds. 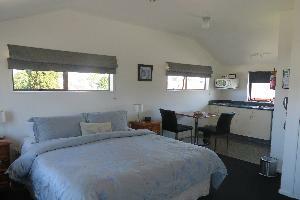 A single bed can be placed in the lounge if required. Full kitchen. Sky TV. 32 inch TV. DVD player. Complimentary DVD library. Bathroom off lounge. Couch. Guest chair. Dining room table and chairs. Parking directly outside unit. Outside seating. 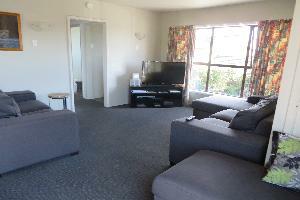 Ground floor fully self-contained Two bedroom unit. A king and 2 singles. Full kitchen. Sky TV. 32 inch TV. DVD player. Complimentary DVD Library. Bathroom off lounge. Couch. 2 tub chairs. Dining room table and chairs. Outside seating. Carport. Upstairs with its own deck and outside seating. A queen bed in the bedroom and a single bed in the lounge. Bedroom chair. Fully self contained. Full kitchen. Bathroom off lounge. Sky TV. 32 inch TV. DVD player. Complimentary DVD Library. A 2 seater couch. Dining room table and chairs. Parking directly below unit. 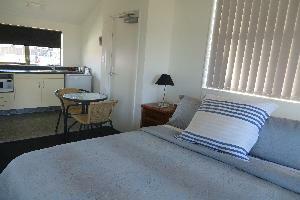 Upstairs fully self contained one bedroom unit with outside deck and seating. 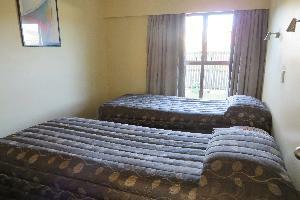 A king bed in the lounge and 2 single beds in the bedroom. Bedroom chair. Full kitchen. Dining room table and chairs. 2 tub chairs. Bathroom off lounge. Sky TV. 32 inch TV. DVD player.Complimentary DVD Library. Parking directly below unit. Very sunny upstairs fully self contained three bedroom unit with a king split and 2 doubles in the bedrooms and a single in the lounge. 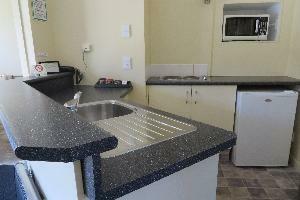 A full kitchen with a large fridge/freezer, a range/oven, microwave, slow cooker etc and dining room table and chairs. a 3 seater couch, a 2 seater couch and an ottoman. Balcony/deck off main entrance. Sky TV. 42 inch TV. DVD player. Complimentary DVD Library. Toilet separate from bathroom. Small ironing room with hand basin. Parking directly below. 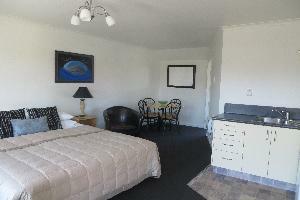 Ground floor fully self contained access studio with a king bed and a single can be added if required. Full kitchen. Dining room table and chairs. 2 guest chairs. 32 inch TV. Sky TV. Large walk in wet floor bathroom. Outside seating. Upstairs sunny studio with outside deck and seating. A king bed. Dining room table and chairs. 2 guest chairs. Ensuite. Full kitchen. Sky TV. 40 inch TV. Upstairs sunny studio with outside deck and seating. A queen bed. Dining room table and chairs. 2 guest chairs. Ensuite. Full kitchen. Sky TV. 40 inch TV.